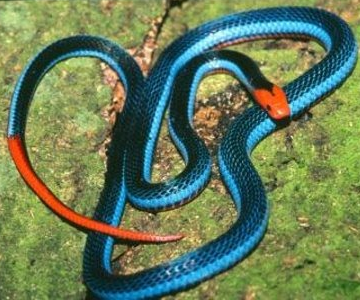 Beware of these colorful and beautiful snakes. They look so attractive and so inviting to touch and hold but they are dangerously deadly. The colorful and bright coloration of these creatures are indications that they are dangerous and deadly. Their bites are considerably fatal. Texas Coral Snakes are brightly-colored venomous snake of the United States. Their traditional coloration is black, yellow and red banding. These lovely-looking but deadly snakes can attain a length of up to 100 cm. Texas Coral Snake venom is a powerful neurotoxin and causes neuromuscular dysfunction. Death was primarily due to respiratory or cardiovascular failure. Another colorful but dangerous snake is the venomous Eastern Coral Snake. It is also commonly known as Common Coral Snake or American Cobra.It is endemic to the United States. It is capable of growing to a length of up to 122 cm. Females are usually longer than males. The Red Spotted Pitviper is a brilliantly colored venomous snake native to Central and Southern China. It is characterized by bright red spots all over its body combined with yellow and black coloration. The beautiful Blue Malaysian Coral Snake is a colorful venomous snake that can be found in Cambodia, Indonesia, Malaysia, Singapore and Thailand. It can attain a length of up to 140 cm or 5 ft. This attractive snake comes in two colors. The one on the above photo is the yellow phase. It can be found in the Wetar Island, Indonesia. The second phase is the green with yellow stripes and the tail is red. It can be found in the islands of Java, Bali and neighboring islands. These snakes are dangerous because they are venomous. 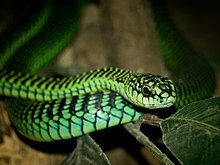 The Boomslang is a small, colorful but venomous reptile endemic to sub-Saharan Africa. Its name means “tree snake” - “tree” (boom) and “snake” (slang). This snake has highly potent venom, which it delivers through large fangs that are located in the rear of the jaw. Boomslangs may open their jaws 90 degrees when biting. The venom of the Boomslang is primarily a hemotoxin; it disables the blood clotting process and the victim may well die as a result of internal and external bleeding. Yellowbelly Sea Snake is an attractive snake but dangerously deadly because it is venomous. It can be found in tropical oceanic waters all over the world. Its venom is highly potent and is potentially lethal. "This snake is about 10 times more venomous than the Egyptian Cobra. It is also commonly called Pelagic Sea Snake or the Yellow-bellied Sea Snake. The Blue-lipped Sea Krait is a colorful venomous sea snake that can be found in the Indian Ocean, Philippines, Japan and many others. It is capable of attaining a length of up to 110 cm. The Eyelash Viper is a brightly colored but venomous snake of Central and South America. These snakes are characterized by their wide array of color variations, as well as the superciliary scales over the eyes. They are often displayed in zoos. It can grow up to 75 cm or 2.5 feet in length. Despite the inherent danger of its venom, it is frequently available in the exotic animal trade. It is frequently captive bred for color and pattern. The cool-looking Yellow-blotched Palm-pitviper, also commonly known as Guatemalan Palm Viper, is a colorful and uniquely patterned venomous snake of Guatemala and Mexico. It can attain a length of up to more than 1 meter.